Comm Eye Health Vol. 28 No. 91 2015 pp 41 - 43. Published online 08 January 2016. 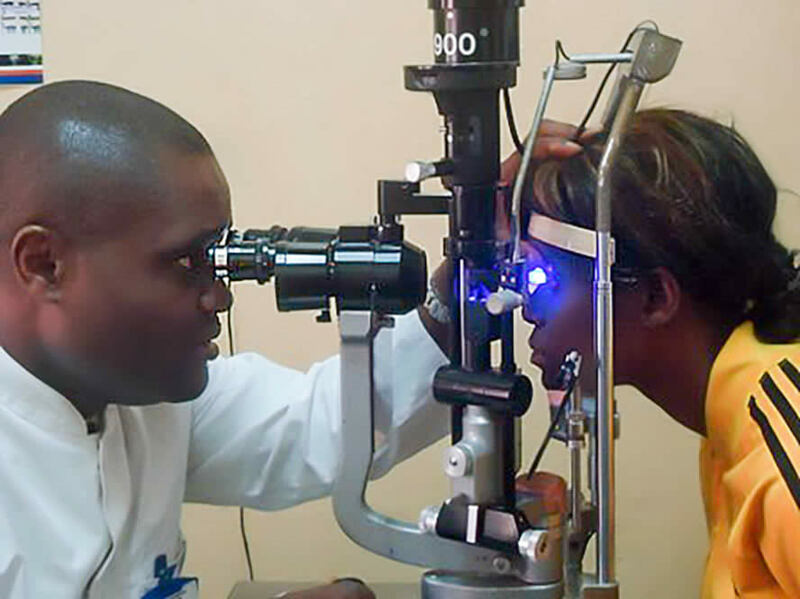 Most eye health workers are involved in managing trauma. In fact, ocular injuries around the world make up a major part of daily ophthalmic clinical practice. Eye injuries range from mild, non sight-threatening, to extremely serious with blinding consequences. 55 million people with eye injuries that resulted in restricted activities for more than one day a year. The demographic pattern (age/gender) of ocular injuries varies with the environment and cause of injury. The general pattern is that of a curve with two peaks: one in the age group 5–25 years and another in people aged 70 years and over. Compared to women, the risk of eye injuries in men is four times higher. Accurate data – essential for guiding management and prevention – has been difficult to record or compare, due to a number of factors. The lack of a widely used standardised template for reporting injuries. 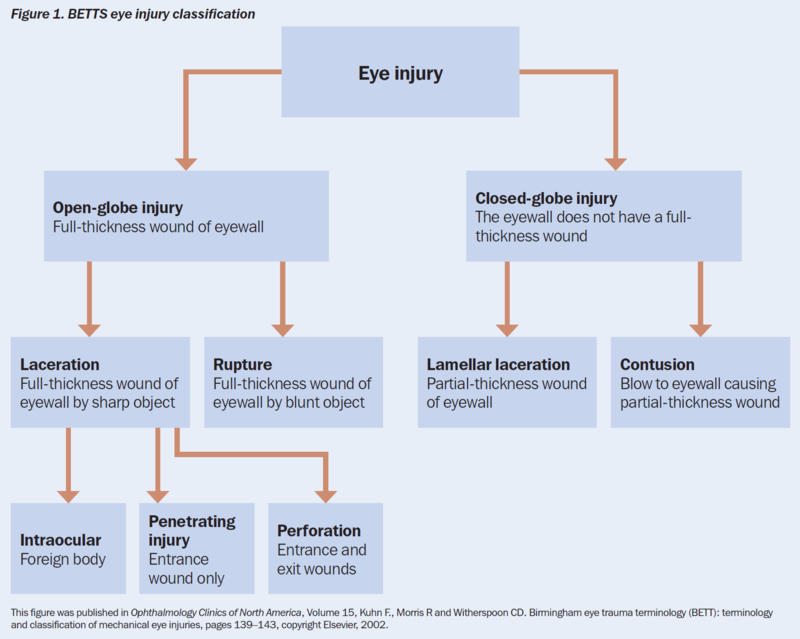 The introduction of the Birmingham Eye Trauma Terminology System (BETTS)2 in early 2000 provided a standardised and simple system to describe mechanical injuries to the eye globe. The panel below provides an outline of this classification, which is applicable to clinical practice and can also be used to audit and create an appropriate registry for injuries. In this issue we look at how BETTS is used to guide the clinician in management. In all eye trauma cases, the main concern of patients and their families is the visual prognosis. To address this, the Ocular Trauma Score (OTS) has been developed; it is based on the BETTS classification system and is used to calculate prognosis (with the assumption that the trauma is managed optimally). On page 44 we introduce the OTS and demonstrate how it may be used. In general, it seems that people assume that eye injuries are the result of ‘accidents’, i.e. that they are outside of human control. It is not always the case – eye injuries are often preventable. This assumption might go some way towards explaining why, in many countries, not much attention has been given to the development of strategies for eye injury prevention. The first step in prevention is to understand the local causes of eye injuries, and their patterns. This is why it is important to establish a local injuries register that uses the BETTS classification system and includes age, gender, place and cause of injury. This evidence can guide the development of local prevention interventions, such as protective eyewear in the workplace, legislation and enforcement about the use of seat belts, and first aid management of agricultural eye trauma. Data will also be comparable with other regions and other countries. In many low- and middle-income countries, trauma cases are often complicated by late presentation and/or previous inappropriate intervention. To have a well-trained first contact person at the primary level is therefore critical for the correct assessment and management of an eye injury. From a public health perspective, neither bilateral nor unilateral blindness data provide a complete picture of the impact of ocular trauma on society. Severe ocular trauma requires expensive hospitalisation and specialist treatment, and often prolonged follow-up and visual rehabilitation. This has significant economic costs for the patient and the health service. It is therefore very important to better understand the local patterns of ocular injuries (through accurate data collection) and to develop appropriate prevention and management strategies. 1 Négrel A, Thylefors B. Review article The global impact of eye injuries. 1998;5(3). 2 Kuhn F, Morris R, Witherspoon CD, Mester V. The Birmingham Eye Trauma Terminology system (BETT). J Fr Ophtalmol [Internet]. 2004;27(2):206–10. Although the eyewall technically also includes the choroid and retina, only the rigid structures (sclera and cornea) are taken into consideration in the Birmingham Eye Trauma Terminology System (BETTS). If an injury is atypical, or ‘mixed’, then clinicians can classify based on their best judgement or on the injury with the worst prognosis. These are partial-thickness wounds of the eyewall. It is rare to find a contusion (caused by a blunt object) and a lamellar laceration (caused by a sharp object) together. In such cases best clinical judgment has to be used to describe it. With lamellar lacerations, a partial thickness wound is present and the clinician should specify whether it is corneal or scleral. Contusions involve bruising and swelling and may cause some structural changes in the shape of the globe, e.g angle recession. These are full-thickness wounds of the eyewall. The choroid and retina may be intact, prolapsed or damaged. Rupture is caused by a blunt-object impact which produces an ‘inside-out’ force that ruptures the eyewall at its weakest point and can result in tissue herniation. A laceration is an ‘outside-in’ mechanism caused by a sharp object and resulting in a full-thickness wound at the impact site. A perforation consists of two full-thickness lacerations caused by the same object (entrance and exit wounds).